We do not curently have theatre tickets available for London Calling play The Clash. This could be because we have simply sold out or it could be that this show is no longer running. The information on this page remains purely for historical and informational purposes. 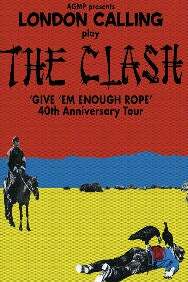 The Clash released their acclaimed second album "Give 'Em Enough Rope&" in 1978. It went to Number 2 in the UK Charts and was the first album by the band to be released in the USA. Sounds Magazine named the album as the 'Best Album of the Year'. NME voted it the '87th Greatest Album of All Time' retrospectively in 1993. London Calling, The UK’s premier tribute to The Clash will be paying homage by playing the album in it's entirety in sequence. They will then go on and play the best of the rest including all the hit singles and more such as "Should I stay or Should I go", "Rock the Casbah", "I Fought the Law", "White Man in Hammersmith Palais", "Complete Control", "Police On My Back", "Clash City Rockers", "Train in Vain&", "White Riot&" and, of course, "London Calling&".